The B-LOC B103 Series 2” Keyless Bushing provides a high capacity, zero-backlash shaft to hub connection for shafts measuring 2” in diameter by means of a mechanical interference fit and transmits up to a maximum of 1771 ft lbs of torque. 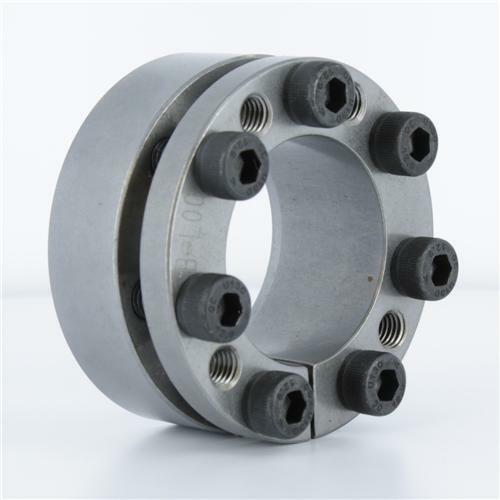 Best Suited For: Applications that require a recessed installation of the bushing, but can accommodate some axial movement of the mounted component relative to the shaft during tightening. B-LOC B103 Series 2” Keyless Bushing provides a zero-backlash frictional connection that will never wear or pound out and can accommodate high-torque, thrust, bending, and/or radial loads. Their shallow, single taper design with integrated push-off threads maintains exceptional concentricity and the ability to transmit bending loads. Since the B-LOC B103 Series Keyless Bushings do not have a flange, the external diameter along the unit’s entire length is the same, therefore allowing the unit to be completely inserted into the component bore for flushed or recessed mounting. The B103 Series also has limited axial movement during installation and is RoHS compliant. 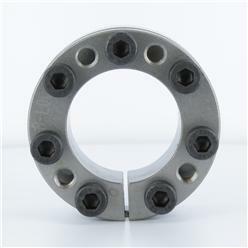 Note: Flange of B103 Series Keyless Bushing should be located inside of hub bore. All Fenner Drives keyless locking devices operate using the simple wedge principle. An axial force is applied- by either a hex nut (Trantorque) or a series of annular screws (B-LOC)- to engage circular steel rings with mating tapers. 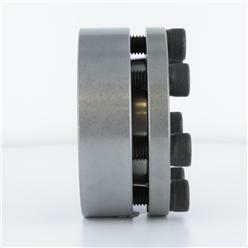 The resulting wedge action creates a radial force on the tapered rings, one of which contracts to squeeze the shaft while the other expands and presses into the component bore.